Back in the dog daze of summer we asked for your vote and you sure responded. 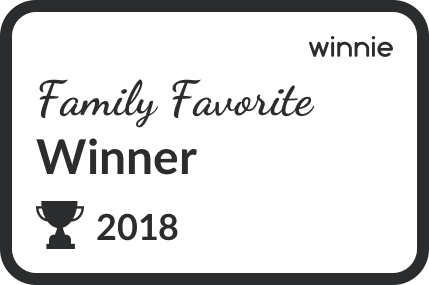 Local moms & dads just picked us as the Best Family Destination in Ridgewood in this year’s Winnie #FamilyFavorites awards! Donna and Kurt would like to thank all of you who voted and also thank our staff of dedicated employees without whom this award would not be possible. There’s a thousand thoughts going thru my head, what made this place special? Was it the petting zoo where children frolic and learn while interacting with the farms animals. There’s many a memory and smile shared in the Petting Zoo. Or perhaps the ever changing decor throughout the year, especially now that Halloween is upon the doorstep. It sure is spooky here. But then again we have Dorothy and the Tin Man with their friend the Scarecrow who along with the Cowardly Lion surely wouldn’t let any harm befall anyone from the monsters and ghosts that lurk around each nook and cranny. And then there’s the entourage of colorful scarecrows all around the garden center and farmer’s market. Maybe the local fresh produce does the trick. Stop by and grab a pumpkin or two this time of year, have some apple cider and get some local honey and oh yes, the gourds. You can make many a fancy display for both home and garden with those jewels of mother nature especially with the other odds n endz of autumn decor that add a whimsical touch to any decorating project. Whatever it is, we just know it is a pleasure serving each and every one of you and making memories for all seasons.